Now we know what you are saying, “there’s two types of sailors, those that have run aground and those that have lied about it.” And that may be true. 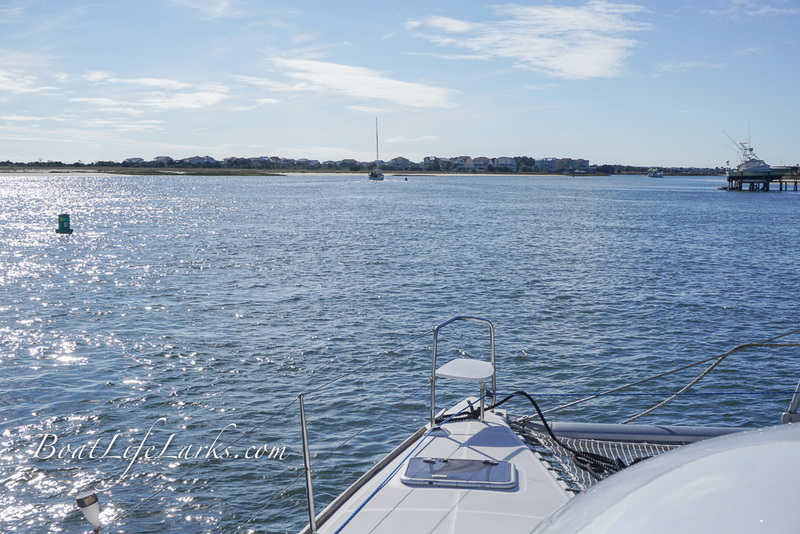 When we bought our first boat to live aboard, a 32-foot monohull, we ran hard aground minutes after casting off the lines on our maiden voyage. Here’s to not doing that again! 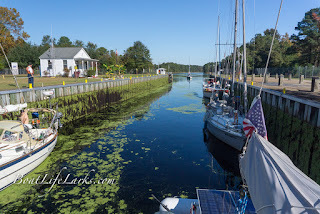 ICW route and two locks on the Dismal Swamp route. From our casual observations, boaters seem to have a lot of trouble staying in the channel on the ICW and we just don’t get it. We don’t know if there’s too much texting going on or what, but it’s just like a road. You have to pay attention and stay in your lane! It is not the open ocean where you can set the autopilot and look up every 5 minutes. Not that we condone that behavior either, but at least you’ll probably be okay. A lot of folks seem opposed to the Waterway. 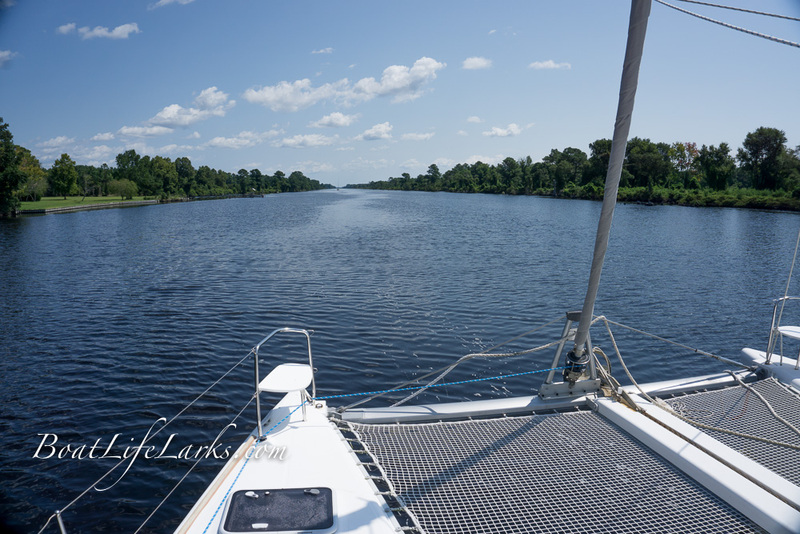 We’ve heard circumnavigators claim that the ICW is the most dangerous place on earth. A lot of sailors don’t like sharing with motor boats and a lot of motor boaters don’t like sharing with sailors. A lot of people seem to want to just set the autopilot and zone out. 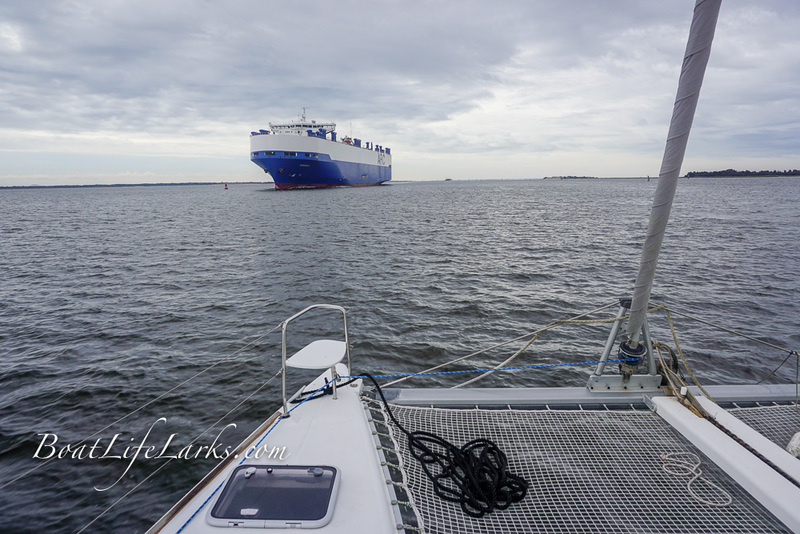 Sharing the channel on Cape Fear River. We love the ICW. Somedays it’s too crowded, but other days you have miles of calm open bays, lots of room to sail and anchorages all to yourself. We really like puttering along and visiting little out-of-the-way towns. 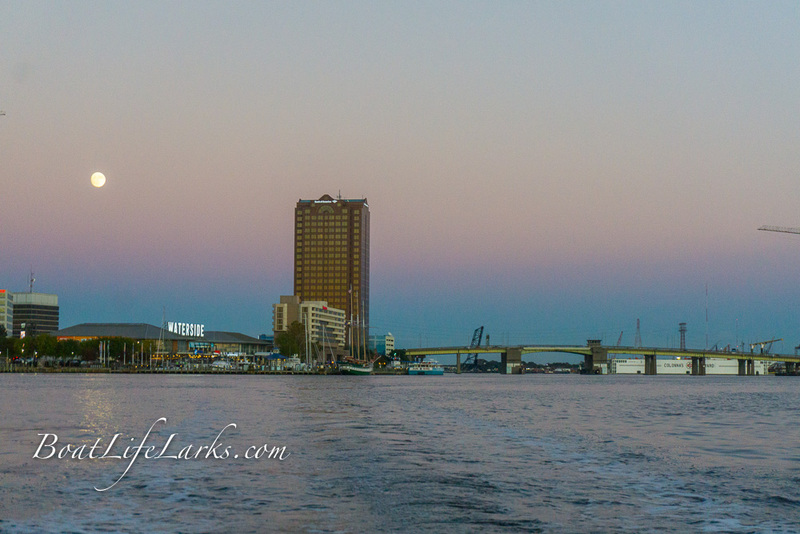 We enjoy visiting cities by boat, which is a completely different experience from showing up in your car. 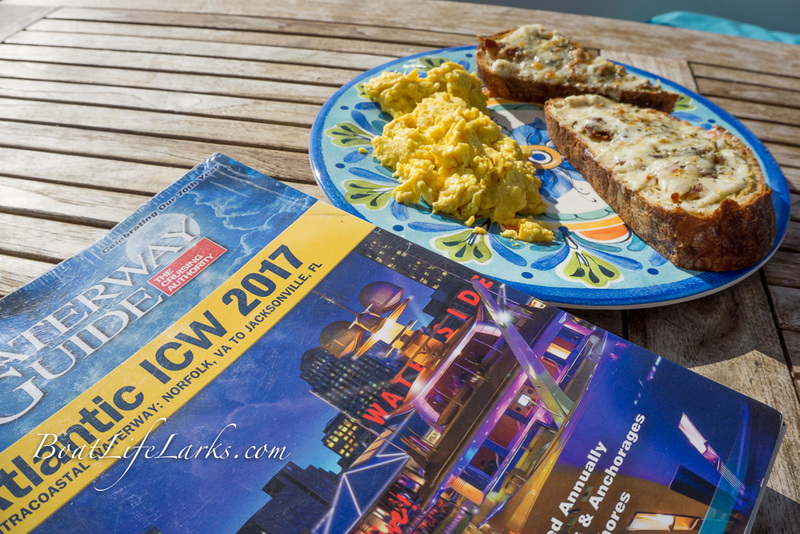 To date, the only section of ICW we have not done is from Charleston southward to St Mary’s, GA. There’s always next year. 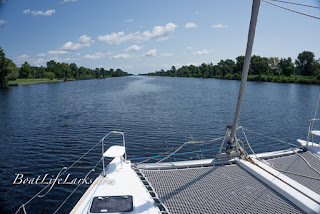 We decided to put together a few tips to help if you’re new to the Waterway. 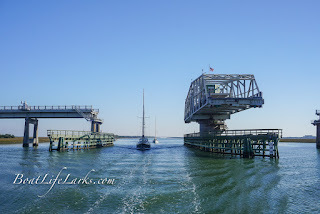 While we were headed south this year there was a lot of chatter on Facebook and between the cruisers we met about the “closure” of the Alligator River bridge. 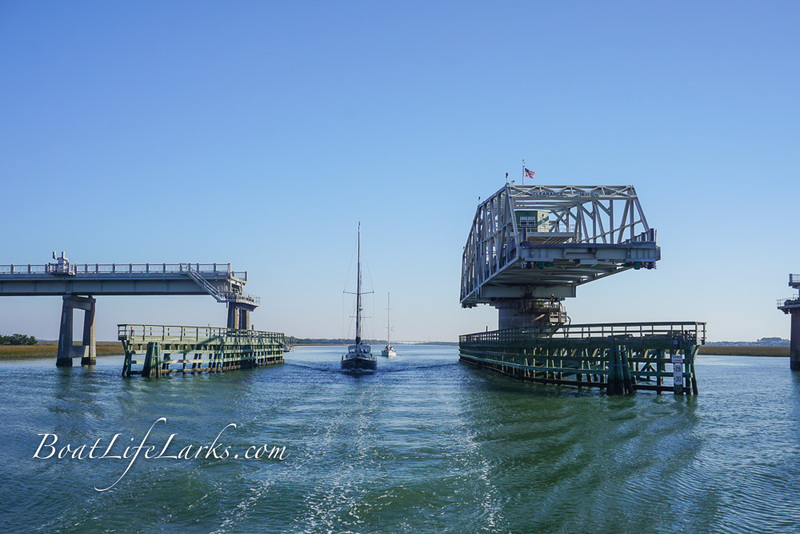 This is a swing bridge in North Carolina that, if it closes, would require you to go through Manteo, by the Outer Banks and cross the very exposed and uncomfortable-in-the wrong-wind Pamlico Sound, something you’d want to wait for good weather to do. A lot of folks told us, “the bridge is closed”. We went online and read the statement from the North Carolina DOT: The bridge will require two-hour advanced notice for openings due to work, M-F 7 am to 7 pm. That’s not really convenient, but it’s not CLOSED. Furthermore, this restriction only applied two weeks in the future—it hadn’t even started yet and folks were saying it’s closed! The same lesson holds true for Active Captain, the web app that you may or may not have on your phone and chart plotter. We’ll address Active Captain in lesson 4, but for now, suffice it to say it takes only one “closed” person to dramatically skew the data you find there. Some folks travel from one swanky marina to the next. They get up, have a big breakfast at a fancy restaurant, get in the boat and travel to the next marina with a fancy restaurant for dinner. 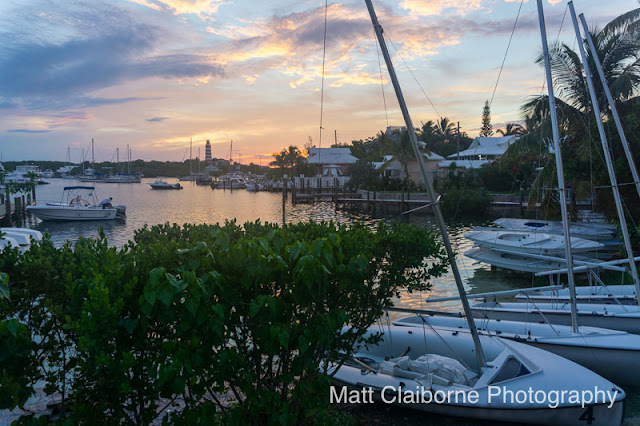 Some folks anchor outside of town and dinghy into a fancy restaurant every night. Swanky Norfolk and the November Super Moon. Some folks anchor away from towns and never leave their boats, enjoying instead the peace and quiet of a scenic sunset. Some people travel a day and explore a new place for a week or more before moving on, and some people move every day. Some move quickly from one major berg to the next to the next and zoom through the pristine, quiet nature bits, and some folks do the opposite and zoom through the cities. It is what you make of it. Quiet anchorage in the middle of No-Wheres-Ville. 1. Hazards where someone had a problem once. More often than not, the problem was they strayed out of the channel because of human error, but blame it on poor markings or confusing signage. These things exist, but not to the level indicated by looking at Active Captain. But if a bunch of people recently posted problems, you know to keep your head up and pay attention. 3. “Expert” reviews…there are some really knowledgeable people in the world that are significantly less jaded by the internet than I. These people write detailed, accurate and helpful reviews that go above and beyond what a platform like Active Captain usually offers. One such user is Bob423. I have a man-crush on Bob. 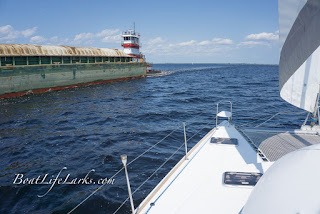 You should check out his website http://fleetwing.blogspot.com/ where he has cruising guides and other helpful articles. Love ya, Bob! Klingons, starboard beam. Keep your shields up! So what, you say. I just pay my taxes and they spend it willy-nilly, you say. They’d never help me, you say. Silly sailors. The US Army Corps of Engineers, which maintains the ICW, continually surveys the Waterway and publishes the surveys on their website. If you load the webpage on your phone, you can access the surveys as you go along. The only downside here is that the surveys are in PDF format, so it’s very difficult to get them into any kind of GPS program. Still, they are EXTREMELY helpful for crossing inlets and other trouble areas you are unfamiliar with. Links are at the bottom of the page. 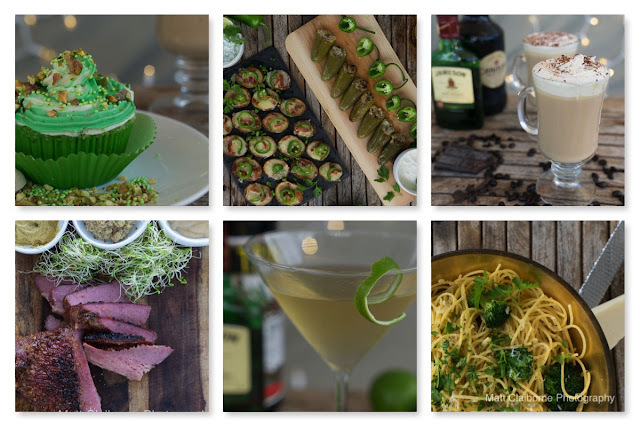 Yes, these two really do go together. That 32-foot monohull we ran aground? A few months later we blew up the engine trying to make a bridge. Find a good table with updated bridge schedules. Again, we like the Waterway Guide for this because it has a Bridge section in the front with ICW milage markers. You’ll need the current version to make sure you have the current bridge schedules (they do change) or at least compare the data with Active Captain. If using solely Active Captain, we find it harder to find the next bridge geographically. Scrolling on the map while zoomed in enough to see the markers is often tedious and it is easy to miss a marker. You really need a GPS for this that you can program in your route to the bridge. Usually, it’s a straight line. Then you get it to tell you your ETA at the bridge. If the bridge opens on the hour, you’ll want to be there AT LEAST 5 minutes before the hour, preferably 10. Adding some "fudge-factor" is important…what if pass and inlet and the current reverses? Your speed will not be constant. Use your best judgment to determine if more power or less is in order. Sometimes it just doesn’t work, and you wind up doing 2 knots between bridges because you know you just can’t make the 9 knots you’d need to to make the next bridge opening. We’ve watched the opening from a mile or two away. Oh well. I’d rather mosey along at 2 knots than blow up another diesel. Call the bridge on your VHF (on the right channel, it’s different in each state!) about 10 minutes before their opening. Even if there are others waiting. We’ve heard stories about bridges not opening because everyone waiting assumed someone else had already called. When you do get the bridge in sight, and if you are early, put the motor in neutral and drift slowly. Don’t rush right up to the span and then have to fiddle with circling, reversing and maneuvering. There are often strong currents under these bridges. Take your time and just make sure you time it to be at the span when it opens with the least amount of maneuvering possible. 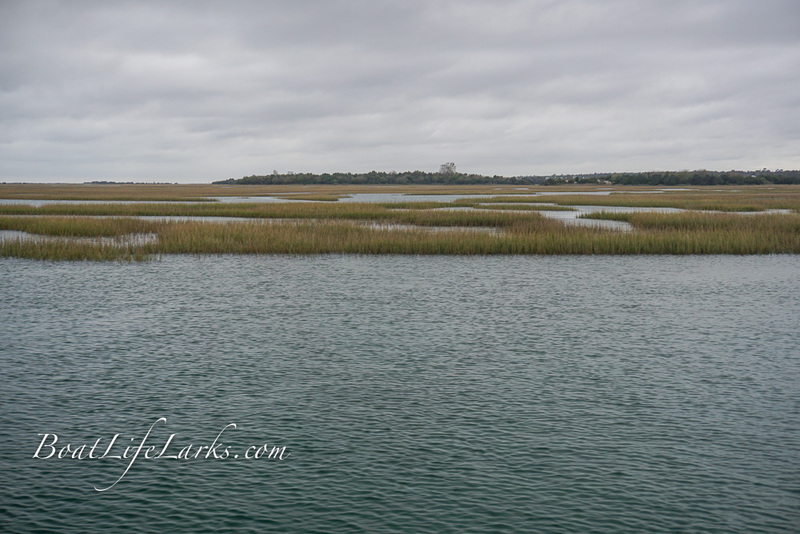 Low country of South Carolina. 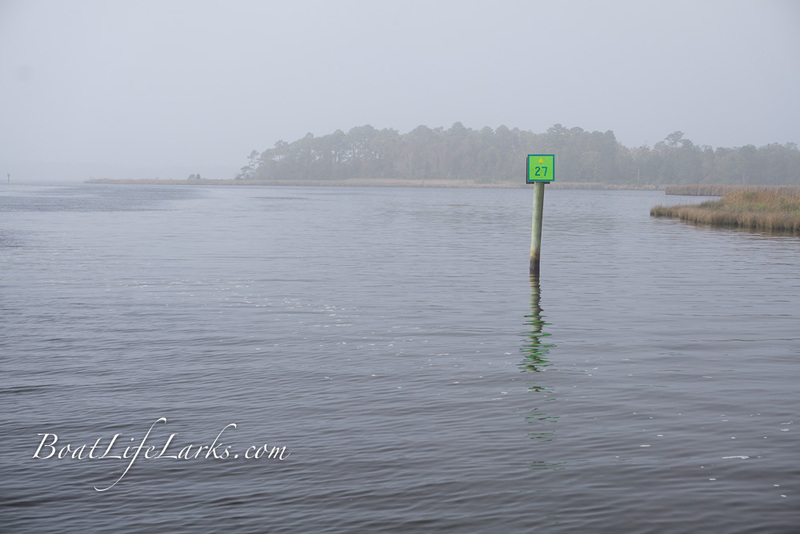 There are a lot of currents on the ICW, and where there isn’t current there is wind. Sometimes there’s current AND wind. You go past inlet after inlet, and the water moves every which way. Sometimes it’s predictable and sometimes it’s surprising. 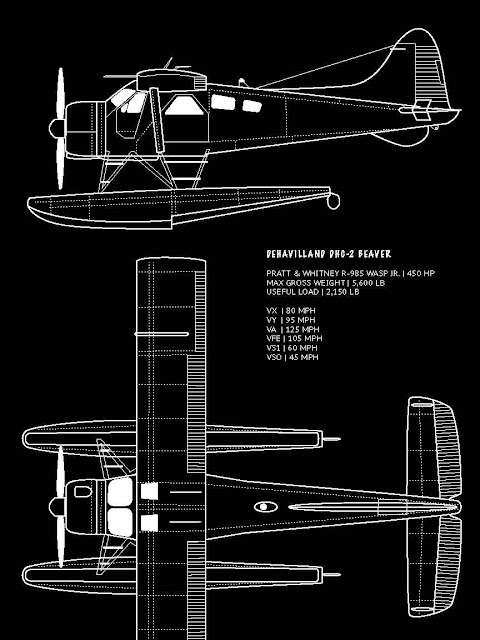 At first, you notice because your ground speed (on the GPS) changes from 3 knots to 9 knots. But what takes a little practice is realizing how it affects your ground track. Yes, you are lined up perfectly with the red and green ahead, but are you still lined up with the ones behind you? 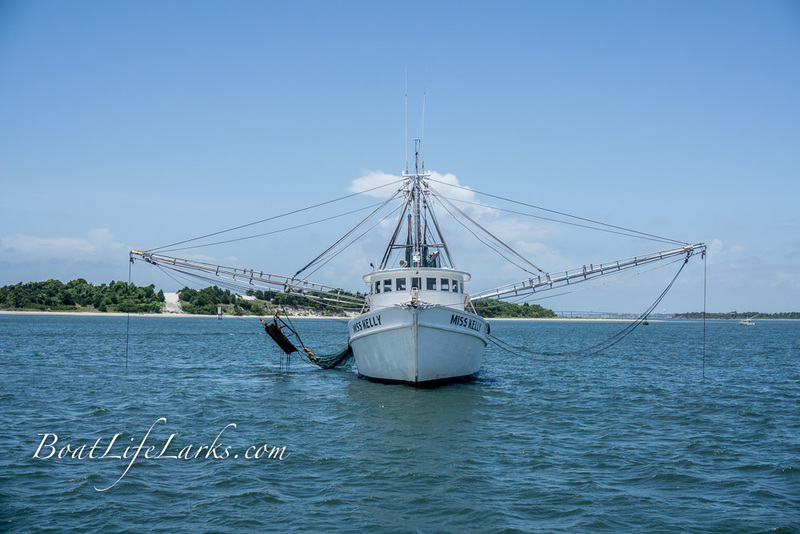 Keeping the bouys straight can be tricky around inlet intersections. If you have a new-to-you boat (or maybe you’ve just never done this), it is totally worthwhile to calibrate the depth sounder. Like, with a tape measure. I guess you could use a lead line, but then you might not even get wet, so where’s the fun in that. All depth sounders have an offset. Some folks like to see total depth so it matches what you should be seeing on the charts, plus or minus tides. Other folks just want “water under keel”. Either way, know what number you are seeing and know that it is accurate! If the weather is good and you’re comfortable with your boat, you can make some serious miles by going "outside" at the right places. 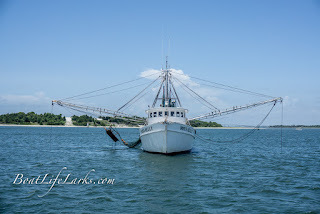 This year we jumped from Charleston, SC to Fernandina Beach, FL. It’s an easy overnight trip and for most of the trip it was glassy smooth, rippleless calm broken only by leaping dolphins. These are nice breaks where you can get the sails up, put the autopilot on and build up your offshore experience. 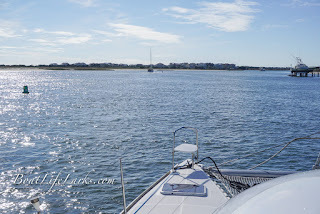 We’ve had similar trips from Beaufort, NC to Wrightsville Beach/Masonboro Inlet, NC which is the perfect spot for an overnight jump. Be careful of interstellar wormholes out there though. One time, during an overnight sail on that stretch in 2016, we departed a normal world and arrived back to a bizarro world where Donald Trump is President of the United States. Yikes! Cruising on a schedule is no fun. You push yourself into weather you don’t enjoy and maybe isn’t even safe. You meet up with a boat crewed by fun-loving nudists and are invited to “buddy boat” with them. You find a wonderful town and want to try all the local dishes but have to leave at first light. Yeah, ok, some of those don’t happen, but we still think every trip down the Waterway should be an opportunity to explore some new place. 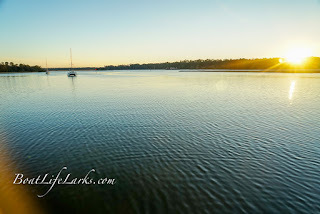 If you have done some moving and want a day off, you should be able to sit at anchor in a quiet cove and enjoy yourself. When the boat breaks down, it shouldn’t be a monkey wrench in the plans but rather an opportunity to get to know a new town a little better. North Carolina has so many side trips you could take. 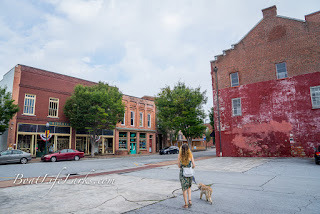 Have you ever heard of the Albemarle Loop? 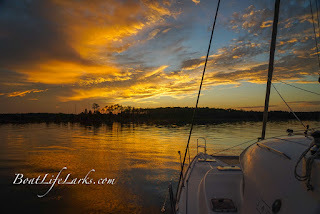 All of the towns bordering Albemarle Sound offer 1 or 2 nights of free dockage to entice you to get off the ICW for a spell and visit some new places. 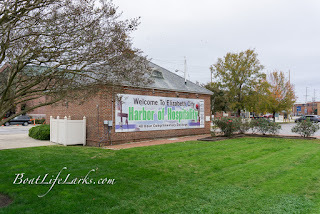 Manteo, Elizabeth City, Edenton…all fun stops. 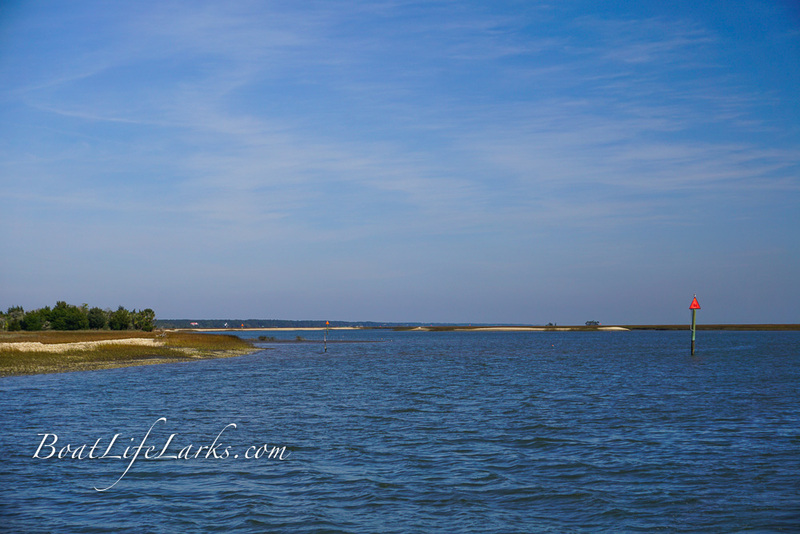 If the weather is nice, make Manteo your last stop on that loop and head out the Sounds Route through the Outer Banks. Overnight at the free dock in Manteo and then head to Silver Lake in Ocracoke, one of our favorite stops. 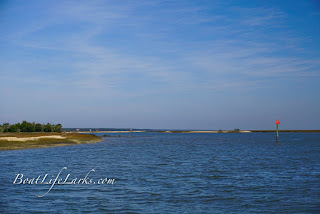 Then head up the Pamlico River to Washington and Bath (where Blackbeard lived when he wasn’t partying with the pirates on Ocracoke). 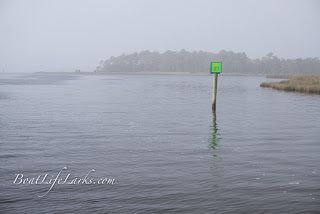 Had enough of the Pamlico? 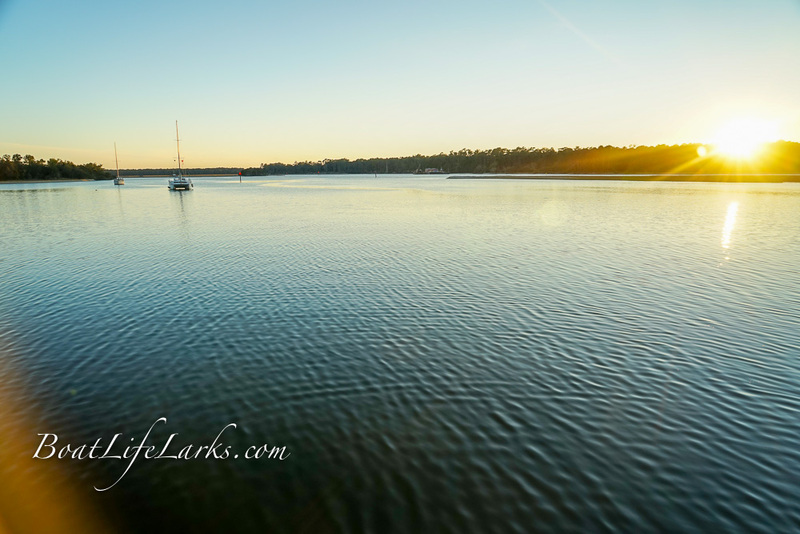 Head up the Neuse River and visit New Bern. And it’s not just North Carolina…take a side-trip up to Savannah. You can head up the St. Johns River into Jacksonville. I think you’re getting the idea. 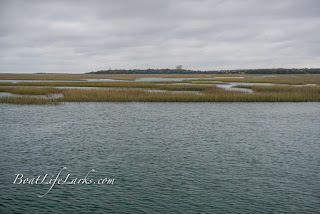 There’s a lot to see and do if you just depart the ICW for a bit. 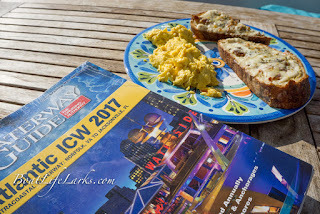 You may also see why, unlike some cruisers, we don’t feel like we’ve really “done” the ICW yet, and we’ve been up and back again twice! 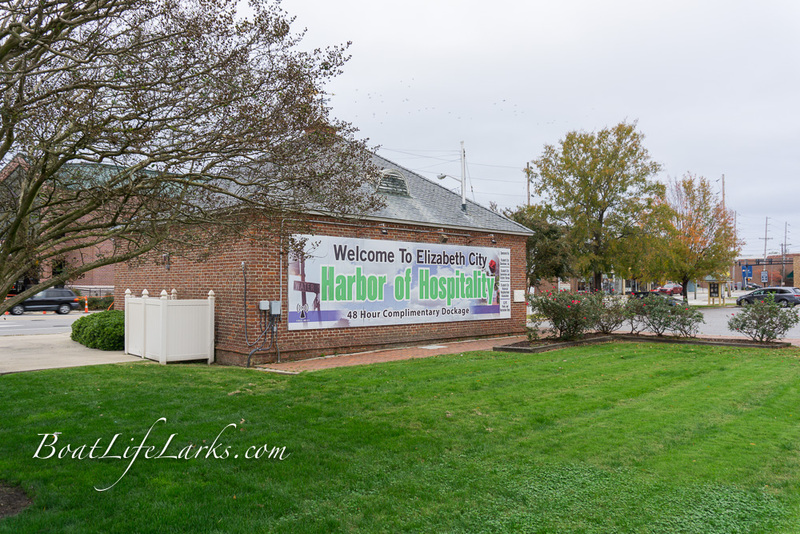 "Elizabeth City, Harbor of Hospitality"
Do you love or hate "The Ditch"? Do you know the current location of the fun-loving nudists?